1. There’s a runner on first, catcher’s interference is called and the batter safely makes it to first as a result of the play. If the runner on first (after safely reaching second base), makes an attempt for third base during the play and gets thrown out, does the offensive coach have the option to negate that out because of the initial interference rewarded to the batter? Or does the defense get to keep the out, because the runner on first advanced past second base at his own risk? The out would stand. The manager of the offensive team would have no option. Once all runners, including the batter-runner advance at least one base when catcher’s interference is called, the interference is nullified. The manager would have an option in a play where all runners did not advance one base. Take the following play. 2. Runners on first and second with no outs. Batter hits a routine fly ball just beyond second. The runners leave the bases. The umpires call the Infield Fly Rule. The fielder drops the ball and runners advance. The defensive team’s manager tells his pitcher to appeal to second. The shortstop takes the throw and throws to first. Double play? When the IFR is called, to put a runner out, the runner must always be tagged when a ball is not caught. Because the batter is out when the IFR is invoked, no runner is forced to advance. Remember, a force only exists when the batter-runner legally occupies first base and pushes up a runner/s. If the batter-runner is retired before reaching first base, which he is when the IFR is invoked, any continuing play requires a tag or an appeal to retire a runner. In the above scenario, the runners would be allowed to stay on second and third since the ball was dropped. If the ball was caught, you can appeal both runners because they failed to tag-up. You reference the following quote from the Official Baseball Rules: “If interference is called during an Infield Fly, the ball remains alive whether the ball is fair or foul. If fair, both the runner who interfered with the fielder and the batter are out. If foul, even if caught, the runner is out and the batter returns to bat.” I do not fully understand the second part of this with regard to a foul ball. I don’t understand why the rule would exist that would allow a batter to remain at bat after having hit a ball that was caught. Also, what are the consequences of the pitch? Is this a strike? I further do not understand the existence of a rule that would actually incentivize a player to interfere with a fielder. If you could explain the rationale behind this ruling I would be very thankful. In a foul ball situation, you can’t award the batter first base. On a batted ball, a batter can only advance to a base only if the ball is fair. In the Infield Fly Rule scenario, if the ball remained fair, the batter would be out per the IFR and the runner who interfered would be out. In a foul ball situation, there is no IFR. Therefore, you can only call the runner out for interfering with the defensive player and declare the play dead. As for the consequences of the pitch, a strike would be called on the batter as in any other foul ball. 4. Minor league game. Right-handed hitter bunts in front of the plate (fair ball). The batter-runner makes contact with the ball. One foot is still in the batter’s box and the other foot that made contact with the ball is completely out of the batter’s box.. 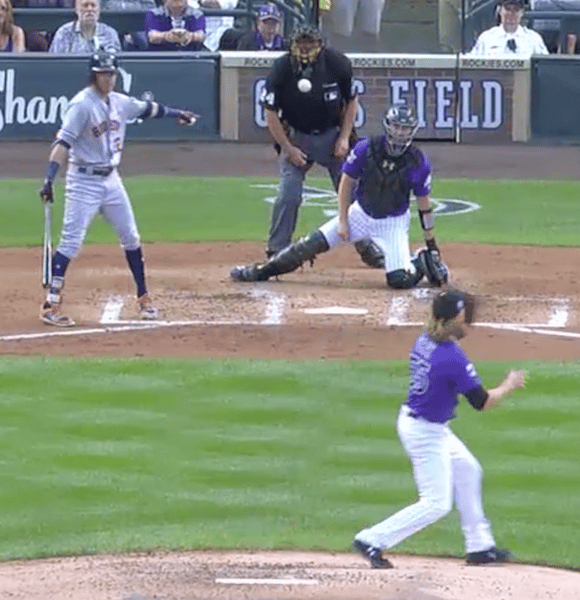 The ump called it foul, explaining one foot was still in the box, and in that situation in order for the batter to be out, he needs to be completely out of the batter’s box with both feet. Was the ump correct? The batter-runner is out. A batter is out if his fair ball touches him before touching a fielder. If the batter has both feet in the batter’s box and makes contact with a batted ball with no intent to interfere, it would be a foul ball. See rule 5.09 (a) (7). 5. The question is in regard to pickoff attempts – what is the rule regarding a fielder blocking the base on a pickoff attempt by a pitcher or catcher? Does the fielder have any obligation under the rules to provide a clear lane for the runner to reach back to the base? Is there any difference between the rule for first base and other bases? Any fielder (including the catcher) can block any base if he has possession of the ball or is about to field a throw meaning the ball is in immediate flight to the fielder. If a fielder does not have possession of the ball and is not in the process of receiving a throw, he should be called for Type 1 obstruction if he blocks the base and the runner should be awarded the next base. On pickoff attempts, the ball is usually in flight toward the fielder when he is blocking the base and there is no call. Some first basemen even drop a knee to the ground to block the runner. If the ball is in flight, there is no obstruction. However, when any fielder, (including the catcher), legally blocks the base, the runner can legally barrel over the fielder. 6. Runners on first and third. The pitcher throws to first. The first baseman fires to third to try to pick off the lead runner. Legal play? It would be legal as long as the throw to first was intended to retire the runner. If the first baseman ran in several steps to receive the throw before he threw to third, that would be a balk because there was no intent to retire the runner. 7. Runners on first and second, one out, ground ball to third. The runner on second takes a step or two toward third but returns to second. My third baseman fields the ball and throws to second. The throw misses the runner returning to second and my second baseman turns the DP, 5-4-3. What if the throw hit the runner going back to second in the back? Dead ball ? Live ball? Interference? Unless the umpire judges that the runner returned to second base to intentionally interfere, this would be a live ball-no interference. Because the runner returned to second safely, and the batter-runner was safe going to first base, you now have runners on first and second and two outs. The runner who was originally on second, has successfully and legally broken-up a double play. It was not a good idea for the batter to kick the ball but interference can only occur when there is a play being made on a runner. Because there was no play being made, the batter cannot be called for interference. The umpire made the right call. 9. As the visiting team, batting in the top of the first inning, are you able to pinch-hit for your pitcher even though he has not thrown a pitch in the game? No. Unless the pitcher sustains injury or illness, he is required to pitch to the first batter or any substitute batter until such batter is put out or reaches base. See rule 5.10 (f).